This article explains how to create list items in SharePoint Online from Tweets based on hashtags using Flow. This has been an interesting article for me to write. I hope you will find it equally interesting to read. The tight integration of Flow and SharePoint Online in the Office 365 ecosystem allows for some powerful interactions of the prominent social networks (Facebook, Twitter, etc.) and in turn lead to the creation of some cool and exciting business applications. The end results are simple yet superior business products. Let’s get started with the detailed stepwise instructions. 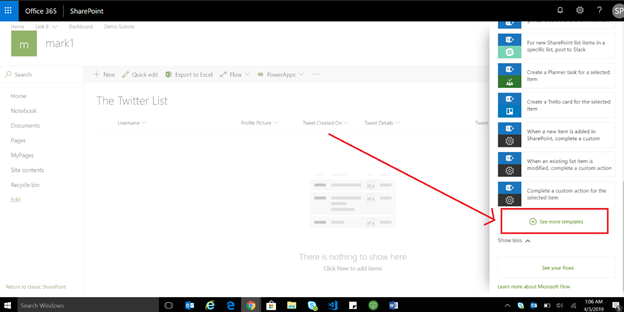 Create a custom list in SharePoint Online – “The Twitter List”. The list contains the below columns. From the list, click on “Flow” and then “Add a Flow”. On the pane on the right side that pops up, scroll through and look for “See more templates”. Click on it. In the next step, you will be asked to provide and authenticate a Twitter account that is going to provide the context for querying all the feeds from the data pool of twitter. Marvel just dropped their final trailer for Avengers Endgame yesterday. Let us see what folks on Twitter are saying about that. We will search in Twitter for the hashtag “#AvengersEndgame”. In this step, we will map the SharePoint list columns with the appropriate Twitter data available. From the “Create Item” block as shown below, select the correct site from Site Address. Once, it is selected, select the list in consideration. After the list is selected, the list columns will be populated. On clicking the text boxes, a new pop up will appear. This section contains all the data available for use from Twitter. 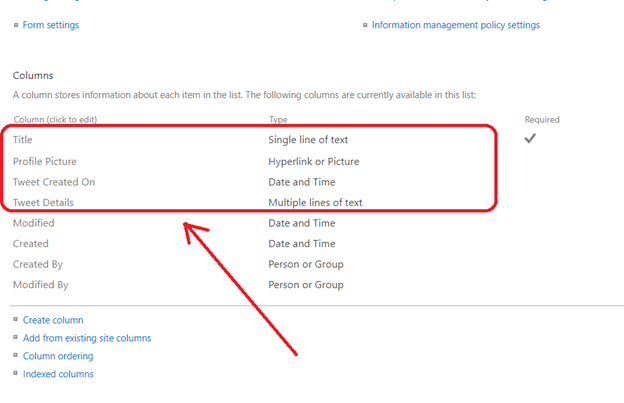 You can map any of the fields to the SharePoint list columns as shown below. 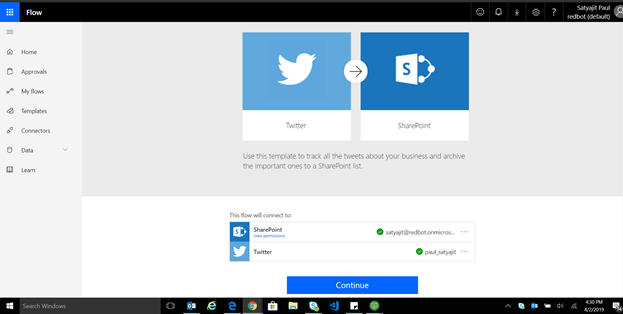 Map all the twitter data to your SharePoint list as per your requirements. This previous step will save flow. If everything goes well, you will be seeing a confirmation screen for the same. If you go back to your SharePoint list, it will be populated with entries (It was flooded with Avengers Endgame tweets and records, as it was a very high trending hashtag). But the Picture column will be still in hyperlink mode. To fix this, just change the settings of that column from hyperlink to picture, and it's done!! 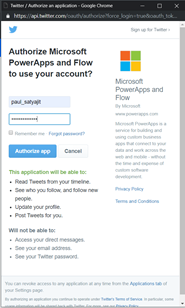 There you go – your SharePoint list is live with the data from Twitter.